There are times, where we can’t form perfect full sentences to express the things that fill up our hearts. Every ways, we have to try, in order to make our voice clearer. In this performance, Ella introduced herself and her works to Jogjakarta public, through her poems, he paintings, and her language. Thus, this initiative is here. 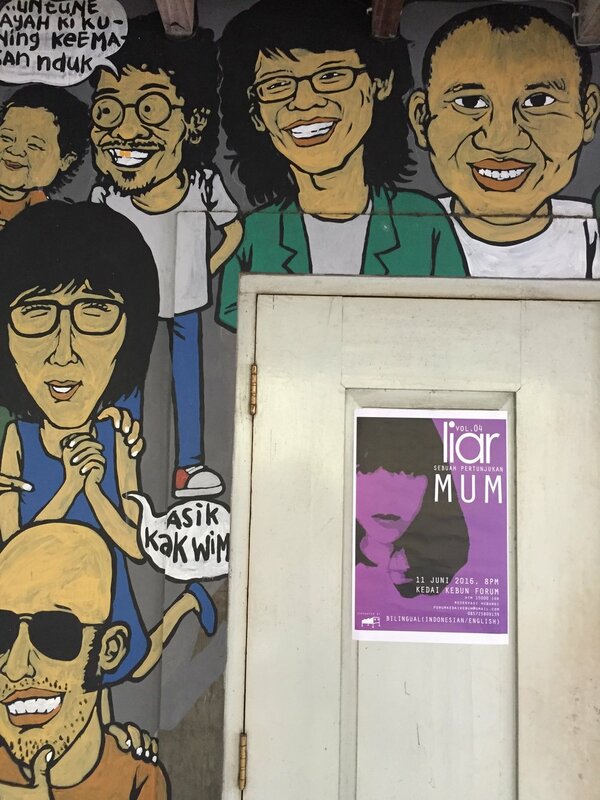 liar, can be read in English as someone who lies, or can be read in Indonesian as wild and not following any rules. We offer you the freedom to interpret this word. 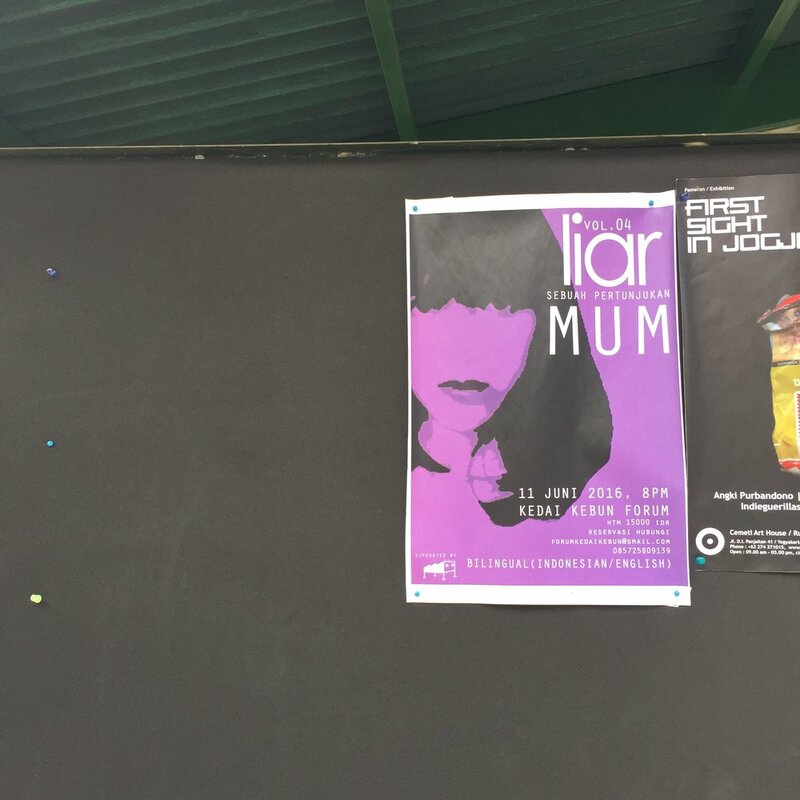 liar, is an initiative to present routine performances every three months, where we invite people to tell and listen to stories in their position as a true human being. When a person is being put in front of public to tell his story, he will be in such an uncertain position. The storyteller wouldn’t know how will the public respond to him. On the other hand, when audience sit to watch someone telling his story, the audience is in such uncertainty where they do not know how will the story turn out. However, most of the time, we choose to numb this state of unknowing in us and kill our emotion. The most common case is that the storyteller will then over-act, trying to create a persona on stage to run away from this uncertainty, while the audience will cover up their fragile state by coming to the performance with a whole load of expectation and prediction, and when the performance doesn’t deliver their expectation, they feel betrayed. Every creation process is a form of uncertainty. We never know if this process will actually produce something, but we stay on track and execute this process. Because we believe, if we succeed, we succeed with pride, and even if we fail, we fail gloriously. Why do we have to hide behind all these lies, when uncertainty is something, which presence is of utmost importance in our lives? Human-to-human connection has always been started with uncertainty. When we give in to uncertainty, it will present us with an opportunity to trust, in return. liar invites all of us to give in to the uncertainty and grasp the chance to trust.